Born 1957 in Quanzhou, Fujian, China. Lives and works in New York. Specializes in artworks using fireworks (such as paintings and performances involving exploding gunpowder), but also creates installations made with objects rooted in Chinese culture. Resided in Japan between 1986 and 1995, and held exhibitions in Nagoya and venues across Japan. 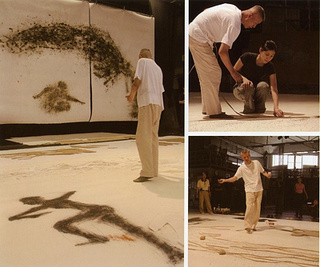 Received the 7th Hiroshima Art Prize in 2007. Recently garnered international fame with a spectacular fireworks display he staged as Director of Visual and Special Effects during the opening ceremony of the 2008 Olympic Games in Beijing. Is planning to exhibit a large-sized "gunpowder drawing" on washi paper at this time's Art Triennial.